Modern approach to design of machines and mechanisms assumes creating 3D models with the help of one of the computer-aided design (CAD) software with parallel strength and dynamics analysis. To simplify importing such models from CAD software to Universal Mechanism we developed tools for direct data import from CAD software to Universal Mechanism. Such import tools are collected within the UM CAD Interfaces module. The current UM version supports data import from: KOMPAS 3D, Autodesk Inventor, Unigraphics NX, SolidWorks, Creo, Pro/ENGINEER and conversion of data from STEP, IGES, Parasolid, SAT format files. Plug-ins for data export from CAD programs in the intermediate UM CAD format (plug-ins for Autodesk Inventor and Unigraphics NX) are free. These plug-ins do not require any license or Universal mechanism to be installed on a computer. You can install them on any computer with Autodesk Inventor and Unigraphics NX, export any assembly or part to UM CAD format, and then copy the resulting files to the computer with installed Universal mechanism and then open them in UM Input program via the menu Tools | Import from CAD | UM CAD file. Data import is supported starting from version Autodesk Inventor 2013. Export in the interim UM CAD files (*.ucf) is supported for 32- and 64-bit versions of Autodesk Inventor. Free utility for data export from Autodesk Inventor in the UM CAD file is available on the following link: www.universalmechanism.com/download/inventortoumaddin.exe. Data import is supported starting from version SolidWorks 2014. Export in the interim UM CAD files (*.ucf) is supported for 32- and 64-bit versions of SolidWorks. Free utility for data export from SolidWorks in the UM CAD file is available on the following link: www.universalmechanism.com/download/swtoumaddin.exe. Data import is supported starting from version Unigraphics NX 9.0. Export in the interim UM CAD files (*.ucf) is supported for 32- and 64-bit versions of Unigraphics. Free utility for data export from Unigraphics in the UM CAD file is available on the following link: www.universalmechanism.com/download/ugtoumaddin.exe. Data import is supported in versions Pro/ENGINEER WildFire 4 and 5. Export in the interim UM CAD files (*.ucf) is supported for 32- and 64-bit versions of Pro/ENGINEER. A utility for data export from Pro/ENGINEER in the UM CAD file is available on the following link: www.universalmechanism.com/download/proetoumaddin.exe. 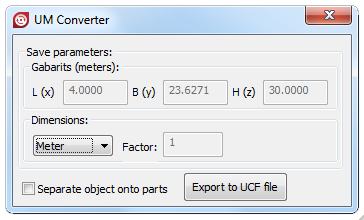 Free of charge converter that loads data from STEP and IGES file formats and saves it into UM CAD files (*.UCF) is available. 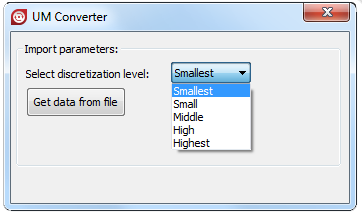 The converter does not require installed Universal Mechanism on the computer. You can install it on any computer, export data from STEP or IGES files to UM CAD files (*.UCF) and then send *.UCF files to a computer with installed UM and load *.UCF files there in UM Input program. 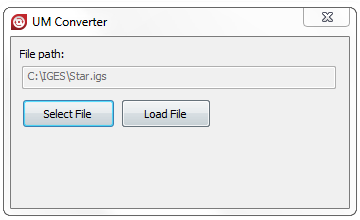 This converter is included in UM since v. 8.4. Independent installation package is available via this link. The converter uses libraries from Open CASCADE Technology package that is distributed under GNU Lesser General Public License (LGPL) version 2.1. An intermediate external converter is used for reading 3D CAD models in STEP (both AP203 and AP214), IGES, X_T (Parasolid), SAT formats. This program is commercial software CADlook (www.cadlook.com). The user purchasing UM with the ability data conversion from the formats listed above, must purchase CADLook software additionally. On request CADlook license can be delivered along with UM (according to the current CADlook price list) or purchased by user separately (directly or via third-party software distributors). In the case of delivering CADlook along with UM means that the price of the CADlook license must be added to the price of UM module 'CAD interfaces: STEP, IGES'. The user working with UM trial might get access to the 15-day CADlook trial.